Guided kayaking tours and rentals are available that include Nueces Bay, Nueces River, or around the USS Lexington. 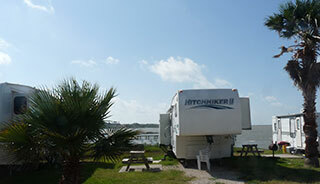 Tours can also be arranged to depart from the Sea Breeze RV Park. For the young or young at heart, try your hand at windsurfing. 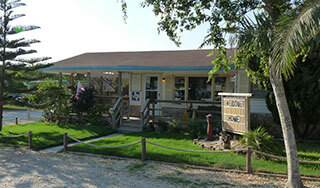 Lessons are taught daily at nearby North Padre Island. See over 1,000 animals represented at the entertaining Texas State Aquarium. 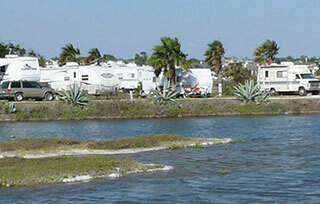 Situated along the shores of Nueces Bay less than 10 minutes from many Corpus Christi attractions, the appropriately named Sea Breeze RV Park offers scenic Bay views for birding, fishing, swimming, or just relaxing with family or friends. As we drove up, we saw some kids having a great time flying kites. There are over 140 full-hookup RV sites to choose from, with 50 amps, phone/modem hookups, free wireless Internet, and several pull-throughs available. About 20 sites have the best views right next to the Bay. 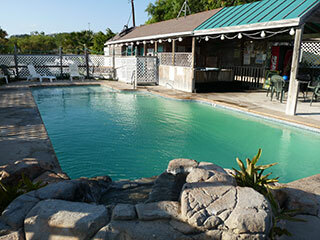 Sea Breeze RV Park has a heated outdoor swimming pool with wading pool on one end and waterfall on the other. 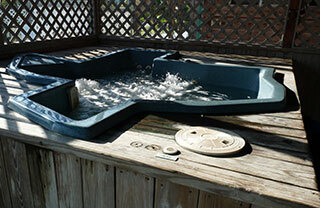 A covered area includes a unique Texas-shaped hot tub with nearby patio chairs and tables, and a large clubhouse. A large laundry room also includes a TV lounge, exercise equipment area, with computer modem connection, bathrooms and showers. During the summer, daily temperatures average in the 90's (although it feels cooler with the Bay breeze), and in the 70's at night. Many winter Texans choose the park to stay also during the mild winters, with average daytime temperatures in the 60's, and in the 40's at night. A large clubhouse near the swimming pool is available for planned events and activities held throughout the year. Next to the clubhouse is a ping pong table, foosball table, and drink machine. 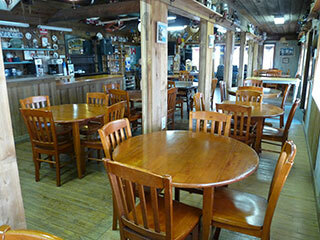 Picnic tables and grills are located in several areas of the park, a Bay firepit, and also an area for horseshoes. Near the entrance to the park is a miniature train and a rustic covered wagon, plus a vintage Teardrop camper. The park provides a fishing pier (lighted at night) along the Bay for guests to use for fishing. With the park amenities and nearby attractions, be sure to plan ahead to make sure you get a site at Sea Breeze. We would like to thank the Sea Breeze RV Park for assisting with our feature and accommodating us at their special Texas RV park along the Nueces Bay. The Sea Breeze RV Park is only 9 miles away. Take Exit 1 for US-181/TX-35/TX-181 going towards Portland. Merge onto TX-35 N/US-181 N in 6.5 miles. Exit at Moore Ave going towards FM-893. Turn left onto Moore Ave. Turn left at County Rd-70B/Marriot Drive. Turn left at County Rd-81D/Doyle Drive for 0.2 miles to RV Park entrance. After entering the town of Portland, turn right at Akins Drive and go 1 mile. Turn left at Moore Ave., then right at County Rd-70B/Marriott Drive. Turn left at Allen Drive/County Rd-81C. Turn right at County Rd-81C/Sea Breeze Lane. As we walked along the park shoreline, I watched a Black-necked Stilt with distinctive long legs and sound as it hunted for tadpoles. The Corpus Christi area is a birders paradise. Guests also enjoy fishing along the Bay of the park. 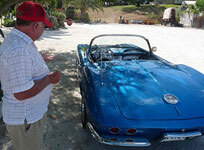 Sea Breeze RV Park owner and classic car enthusiast Otto Schuster showing off his one-of-a-kind Corvette Stingray with a 1961 body and a 1958 front grille. 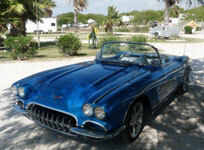 Otto has refurbished many classic cars over the years, and has a special love for renovating classic Corvettes. I was tempted to ask him if I could go for a spin as I drooled over the car but was behind schedule in getting to an appointment. Note the vintage Teardrop camper in the background of the photo.